(Manama) – The Minister of Foreign Affairs, Shaikh Khalid bin Ahmed bin Mohammed Al Khalifa, affirmed that the security and stability of the region face many serious challenges, particularly the spread of terrorists, whether supported by some countries or sponsored by violent non-governmental organisations in the region. In his address to the Manama Dialogue at its 13th session, the Minister added that the coup militias in the Republic of Yemen have refused to play any positive role in the building of Yemen, have turned against the legitimate regime and sought to establish a terrorist state subject to the Islamic Republic of Iran, which must not be allowed. He also praised the important role of the Kingdom of Saudi Arabia in providing and facilitating assistance to the affected areas through the King Salman Centre for Humanitarian Aid and Relief. The Minister referred to Hezbollah’s terrorist activities in the Lebanese Republic, as it provides a model for what might happen if a terrorist organisation takes control of the political decision, where it does not respect Lebanon’s laws and customs and does not abide by the will of the Lebanese people but receives its orders from Iran, which he said was the main reason for the continuation of the Syrian crisis. This is in addition to the smuggling of weapons and explosives and training terrorists to carry out terrorist operations in the Kingdom of Bahrain, Kuwait and other countries. Shaikh Khalid stressed that this party cannot remain in its terrorist practices everywhere without deterrence. He said that the decisions taken by the Kingdom of Bahrain, the Kingdom of Saudi Arabia, the United Arab Emirates and the Arab Republic of Egypt on the boycott of Qatar came after decades of country’s practices that targeted the security and stability of their countries as well as attempts to undermine national security and social peace in the Kingdom of Bahrain and overthrow the regime with the assistance of associated parties, in addition to the financing of terrorist operations in other countries. The Minister stressed that the option has always been for brotherly and friendly dialogue and close cooperation between the members of the Gulf Cooperation Council (GCC) in order to preserve the unity of the GCC states, but without success and without stopping these terrorist practices, and hostile and terrorist policies and practices. He said that the four countries are ready to re-establish their relations with Qatar, provided that Qatar abides by the agreements it has already signed and stops its support for terrorism, undermining their countries and interfering in the internal affairs of other states. 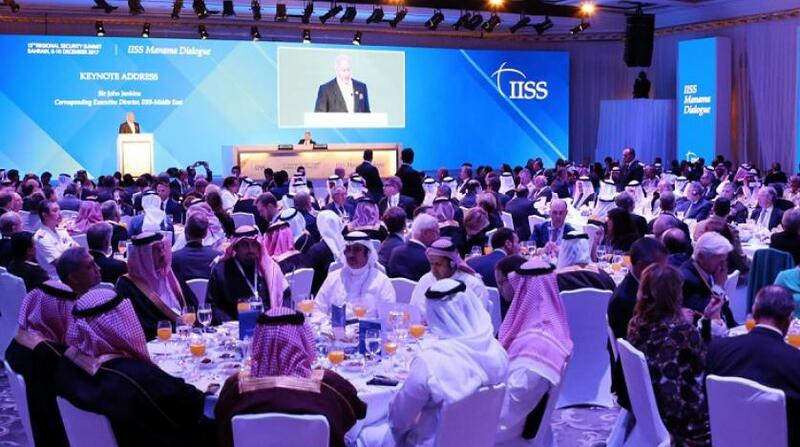 Shaikh Khalid pointed out that the strategic alliance with the United States and the United Kingdom is vital to ensure the security and safety of the Arabian Gulf and its vital importance for international peace and security. He stressed that mutual respect for the sovereignty of states and the commitment of all countries not to interfere in internal affairs are the most important steps towards the resumption of security and stability of the region. He reiterated the position of the Kingdom of Bahrain in support of the efforts of the Iraqi government headed by Dr. Haider Al Abadi to rid the occupied areas of the remnants of terrorists and to ensure the return of the population of Mosul to their homes. The Minister criticized the role played by Iran, stressing that it is one of the most countries that undermine the security in the region and destabilize governments and support terrorist militias to implement its own agenda, as it can at any moment move its agents to carry out terrorist operations, which can be seen clearly in Yemen In Syria was well as in the Kingdom of Bahrain through Iranian sabotage and terrorism. Shaikh Khalid stressed that the great difference between the Iranian people, who have a long history and a rich culture, and the regime of the Islamic Republic of Iran, which is hindering Iran’s progress, is the attempts to export Iran’s revolution and not abide by the accepted principles and international laws, instead of joining the ranks of responsible countries in the international community to benefit the region as a whole. The Minister said that the decision to recognise Jerusalem as the capital of Israel would threaten the peace process in the Middle East and disrupt all initiatives and negotiations to reach the final solution. It is a clear violation of the international resolutions that affirm the inalienable rights of the Palestinian people. He added that East Jerusalem is an occupied territory whose occupation must be ended and that modern countries cannot be built on the basis of old claims. In this case, he said, we will face several demands, one followed by another, and we will never achieve lasting peace in this region. He stressed the importance of preserving the pivotal role of the United States of America to reach a two-state solution based on the resolutions of international legitimacy and the Arab peace initiative. Shaikh Khalid stressed that the only representative of the peoples is the states and not the terrorist organisations, and that the region will not achieve permanent stability until after the elimination of these groups and terrorist militias.